View "BRAND NEW" Deer Valley Listings - This Week! Deer Valley real estate is some of the most desired in Park City Utah. Deer Valley Resort® consistently ranks among the best ski resorts in the country. The skiers-only resort is well known for its high standard in mountain grooming, service, dining, and lodging. Real Estate in Deer Valley offers distinctive luxury ski homes for sale, delicately appointed townhomes, and amenity-rich hotel style condos for sale. The "Deer Valley Difference" begins with skiing and enhanced when owning Deer Valley Luxury Real Estate. The Deer Valley Real Estate area is comprised of four distinct neighborhoods: Deer Crest, Empire Pass, Lower Deer Valley and Upper Deer Valley. Deer Valley homes set the standard for luxury living in Park City Utah. There are great ski homes for sale in Deer Valley. Typically the best direct ski homes are located in the Deer Crest and Empire Pass areas but a selection can be found in the Upper Deer Valley area such as the exclusive Bald Eagle neighborhood. We can help you realize which Deer Valley homes are true ski-in and ski-out. Deer Valley offers a substantial selection of condos and townhomes at various price ranges. The most affordable options can be found within Lower Deer Valley. Most of these are on the free transit system, close to Main Street, or a short walk/shuttle ride to the ski lifts at Snow Park Lodge. Condos in Upper Deer Valley are near the Silver Lake Lodge or close distance to Deer Valley Resort®. The Village at Empire Pass is Deer Valley's newest and most exclusive ski-in ski-out community and is well knowns for The Montage. You may be interested in the convenience of a condo hotel that offers more amenities than a typical condo such as front desk staff, restaurant, spa, swimming pool and meeting spaces. Contact us at 435-901-2781 for help finding the right condo or townhome for you and your family. Let us help you have the best representation when buying or selling Deer Valley Real Estate. Contact The Wallace Group at Keller Williams Park City or Call/Text 435-901-2781 for Deer Valley Real Estate assistance. Deer Valley offers the same incredible service in the summer that it is known for during the winter ski season with ideal mountain biking, hiking, stand-up paddle boarding, scenic chairlift rides, a kids camp program, horseback riding, and instructional guided tours. The Deer Valley chairlifts provide access to over 50 miles of mountain biking trails as well as over 20 miles of hiking trails and an overlook point with views of mountain peaks at the Jordanelle Reservoir. Snow Park, at the resort's base area, hosts World Cup ski competitions in the winter, and world recognized music performances in the summer. Find Your Way Home to Deer Valley in Park City where Deer Valley Real Estate is luxury at it's best. The charm and solitude found in Deer Valley and its secluded mountain setting is only 40 miles from the Salt Lake International Airport. Direct flights from most major cities enable you to leave home in the morning, arrive at your home or condo, and ski Deer Valley Resort® the same afternoon. If you're pondering the idea of investing in Park City Utah then Deer Valley real estate should be at the top of your list. Snow Park (Lower Deer Valley) had a rope tow back in 1929. Perhaps Deer Valley real estate was a dream to a few with vision. 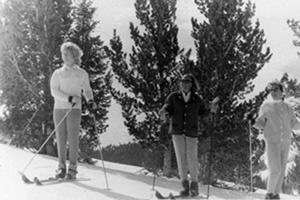 Skiing began at Deer Valley in February 1936 with the first held "Park City Winter Carnival" on a north-facing hillside at the head of Deer Valley. The Works Progress Administration (WPA) built ski-trails, toboggan slides, slalom courses, ski-jump takeoffs, and shelter cabins for the events. The first ski lifts appeared in 1946 when two local residents resolved to build an authentic skiing facility in the area with a mechanized ski lift. Using homemade wooden towers and surplus mine equipment they assembled Utah's first lift. "That lift was made out of pine poles that we cut when we cleared the area---we built the wheels and we bought a big Hercules truck engine that sat up on the top," Carpenter stated in 1986. The ski area was called the Snow Park Ski Area. I wonder what real estate cost then? In 1981 a private resort officially opened in the same area as Deer Valley Resort®. Now consistently ranked among the top ski resorts in North America, Deer Valley has found it's place in history. Providing 21 lifts with 12 high-speed quads, 100 trails, and six bowls. Offering an abundance of terrain for every level of skier, Deer Valley Resort® & Deer Valley Real Estate can be the perfect place for your families vacation home. "Deer Valley Luxury Real Estate is where the past and present come together to propose the best of the Park City Lifestyle" Contact Robert Wallace & Cindy Wallace about Deer Valley Utah Real Estate.